It's Walky! » Empty parking lot. This is where the narrative splits into two! Up above is the regular narrative, with Joe’s ongoing drama currently unfolding. Down below is… well, it’s Walky’s Apocalypse-O-Vision, judging by the inverted colors. This scene takes sometime shortly into the future. (Well, the regular narrative’s future. Not OUR future.) Anyway, yeah, for a while I was technically drawing two strips a day. Whoof. Heads up, it gets pretty gruesome. Likewise, I didn’t realize it was Walky’s visions until now. It’s a shame that the strip didn’t have Willis’ commentary the first time around. It makes it a lot easier to make sense of what’s going on. I always assumed it was concurrent-with-whatever-was-happening-in-the-other-half. You broke the pattern! You should have had a Zero Wing quote on the top. This section was awfully confusing the first time around, because it wasn’t at all clear whether the inverted panels were happening concurrently with the regular ones, or were a vision of the future, or were even definitely happening at all. Yeah, seriously. I only got that the lower panel was supposed to be near-future vision thanks to the commentary. Previously, I read it as concurrent. Yeah that brief explanation clarified a years-old lack of surety about this. I’ve read through this arc before, but I didn’t realize the bottom strips were all Walky’s apocalypse visions until I read your commentary on today’s strip just now. I just assumed they were what was going on inside the SEMMF building while the top row was stuff going on at the same time outside SEMMF. This part always confused me. I mean hey, at least you only had to shade one of them. Does that mean that the bottom panel events aren’t necessarily panning out exactly the way it’s shown? Particularly wondering for a bit later when a certain character is in both concurrently. Are the bottom panels showing what would happen if they were there? Or are they not happening at the same time. See, when a certain character appears in both, that was the moment in the original run when it became clear to me that these were not happening at the same time. From what I remember, by the end it’s pretty clear that these are just two parallel points of view that converge at the end. I think we even see Robin entering the second view having just exited the first view (though I think it happens out of order). Wait… (spoilers ahead) if the black strips were visions taking place in the future, why didn’t Walky ever attempt to “unturn” Beef. When I thought these were simultaneous I figured it was a turn that nobody saw coming but Walky literally sees it coming. I feel like being able to crank out two strips a day is probably the webcomic artist equivalent of reaching Super Saiyan. 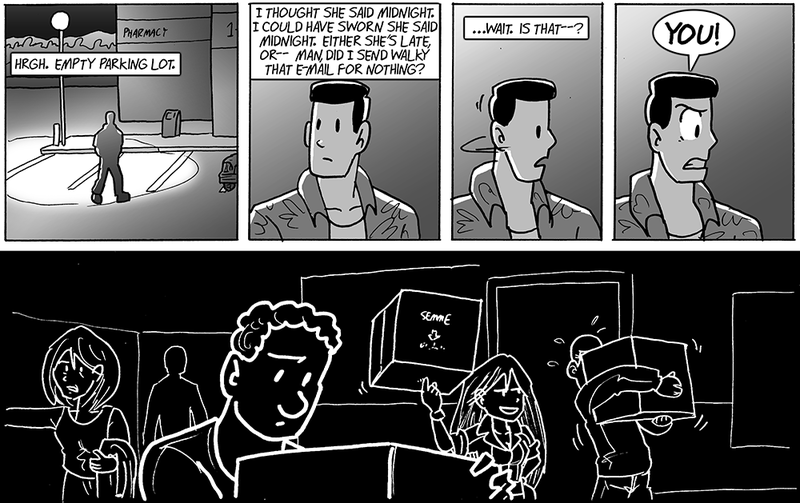 In this comic, someone is unsure about whether they correctly remembered a meetup at midnight. In DoA, someone is unsure about whether correctly remembered a meetup at midday. I’m too busy loving the difference between Sal and Jason’s box-carrying to worry about the past’s future. I love the fact that the “this side up” arrow on the SEMME box seems to be upside down intentionally. Maybe it’s the worst roadsign? The manufacturer must have been a huge troll. Oops! Red panel flashback time! Trying to establish my expectations: is the vision going to have interesting story in it, or am I about to, or am I about to sit through Geoff Johns and Michael Bay’s goresplosion lovechild, with all stakes removed because I know it won’t happen, at least like this? Not to spoil the details, but this happens. The starting point and speed at which the top and bottom parts take place is just different. Wait, Joe’s supposed to be meeting someone at midnight and over in DoA Amber’s supposed to be meeting someone at noon? That’s some interesting synchronicity. I was just thinking the same thing, albeit more about their both having a anxiety about whether they showed up at the right time or not — though I’d say Amber’s outweighs Joe’s by a factor of 20 to 1.